Enid Blyton's books have been more widely published than those of any other children's author in the last 50 years. Here she brings favourite Bible stories to life. The Bible text supporting each story is included and illustrations are provided by the ME TOO! series' Stephanie McFetridge Britt. Hardback. 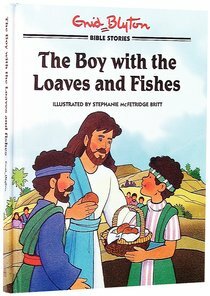 About "Enid Blyton: Boy With the Loaves and Fishes"
Enid Blyton's popular re-telling of favouite Bible stories. Enid Blyton, 1896 - November 28, 1959 Enid Blyton was born in London in 1896. She was educated in a private school and thought that she would become a musician until she realized that writing was her passion. She attended Ipswich High School where she trained to become a kindergarten teacher and eventually opened her own school for infants. Blyton's first poem was published in 1917, entitled "Have You-" which appeared in Nash's Magazine. In 1922, her first book of verses was published, entitled "Child Whispers." In 1926 she accepted a position editing the children's magazine "Sunny Stories" as well as writing the column "Teachers World." Blyton's first full length children's book was published din 1938 and was titled "The Secret Island." After working on the column for years, Blyton quit "Teachers World" in 1945 and also ended her stint as editor of "Sunny Stories" seven years later. In 1953 she started her own children's magazine called "The Edith Blyton Magazine" which featured stories about her characters and news on the clubs formed around them. Her most famous stories were those of the "Famous Five" The Magazine closed in 1959. In the 50's and 60's Blyton was criticized for the language in her book, for being to simple, but some 300 are still in print today. Blyton has published over 600 books in the course of her career. Enid Blyton died in her sleep on November 28, 1968. She was 72 years old.